I’m a lot like Jase. I often find myself distracted at work by other interests. While his are outdoor pursuits, mine involve toys. Either way, I can see a streak in him that I see in myself. Again, like Uncle Si, I suspect the body here is reused. In this it worked out well. Jase pretty much wears a black shirt in every episode at some point. So a basic figure suits him well. While I wasn’t real impressed with Si’s camo, Jase looks naked with out it. His pants are almost always camo on the shirt. The khakis aren’t even cargo pants. If I was slightly more ambitious, I’d swap the two figures pants around. One slight difference in construction here. 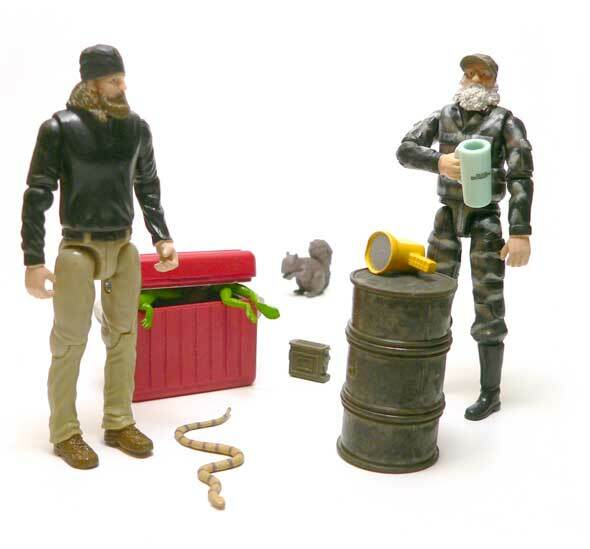 Jase has a screw in his back like an o-ring GI Joe. Si looked to have the hole, but it was filled with a solid plug. 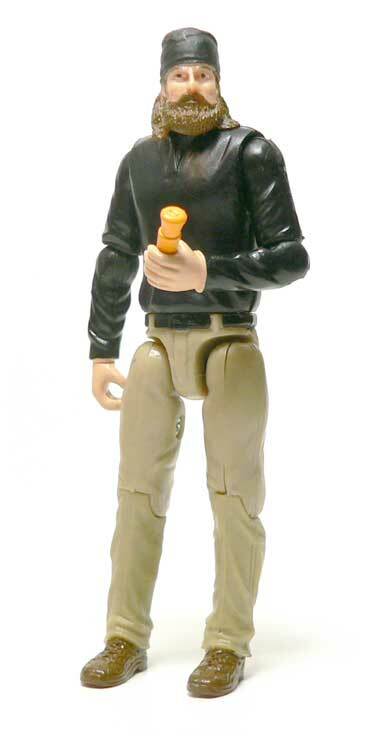 I really expected this figures to be made from something a bit more brittle. 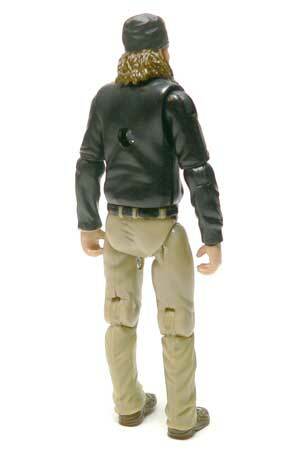 The limbs are more rubbery than a Joe figure and the torso is something similar to a Joe. I would have really have like to have seen bare forearms. That is Jase’s standard look. Sometimes, it’s a t-shirt. Sometimes, a long sleeve pushed up to his elbows. Again, the head is the make or break portion of this figure. And they didn’t do half bad this time. The first thing that sells this as Jase is of course his trademark black skull cap. It’s sculpted correctly. If it’s Duck Dynasty, you know there is a beard here. This one looks a bit better than Si’s whiskers. In this case, Jase doesn’t have grey in his beard, so it’s a solid brown. While a wash would bring out the detail, it isn’t as missed here. Overall, this head looks like Jase. Since he’s just an ordinary dude and not a super hero, the basic body works well to pull off his appearance. The joints are similar to Si’s. Which in today’s world aren’t half bad. The hips are a bit funky and the right one is slightly loose. Also, his waist feels really cheap. One that that surprised me is the elbows. They swivel and have ratchets in them. 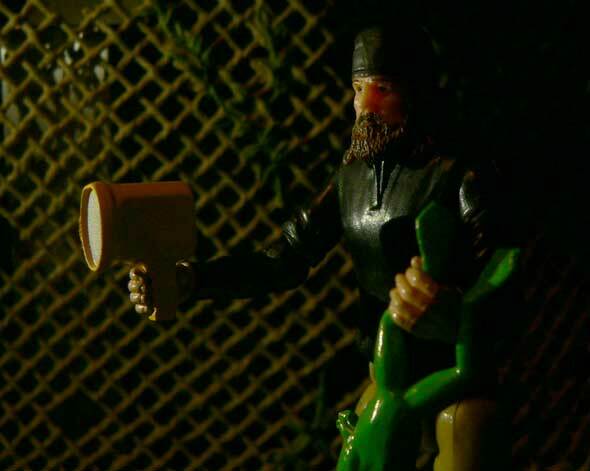 If you watch the show, you will know that Jase loves catching frogs. It’s figured in a couple different episodes. So it only makes sense that he comes with two of them and a spot light for tracking the slippery little suckers down. They are well done enough, the light has some silver on it. There is also a snake that has some paint on it for terrorizing Willie. What gets me with these figures is not what it’s included with these figures, but what’s not. 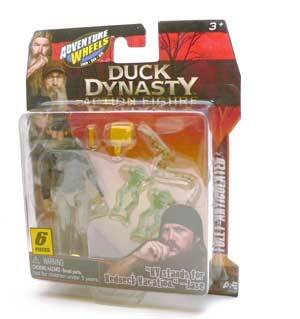 They all include a duck call, but none of them have a shotgun. I don’t know if that is due to Wal-Mart request or not. It just seems like a natural fit. Part of me would like to see Marauder make a hunting shotgun and rifle. It would really finish these figures off. I’d also love to see a good customizer repaint these fellows. I don’t think the sculpts are lacking and if they were finished off just a little better, you’d really have something. I have to say I really only intended to get Si. But for the price, this small line has me lured in. While I passed on Willie in his white sport coat, I wish hadn’t. And I still haven’t managed to hunt down Phil. I’m really impressed with the fact they have a decent number of accessories, fair articulation, and passable head sculpts. Due to lack of camo and glasses, I’d rate Jase a bit higher than his uncle. So if you are a fan of the show, you might want to track him down. For some reason I actually like this one a bit more than Si. 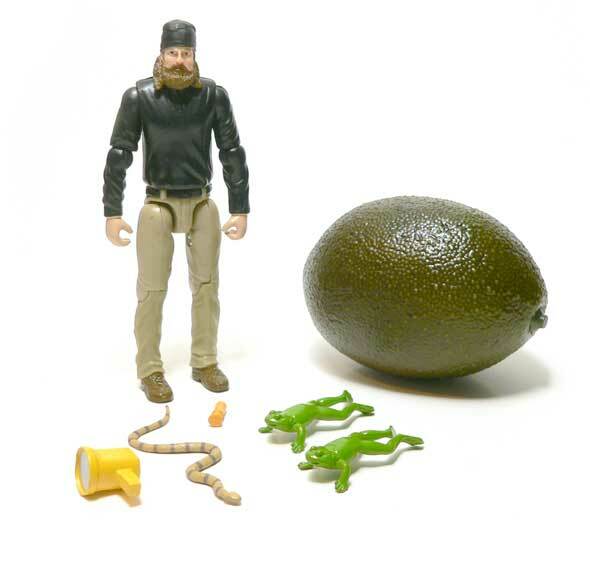 I still have not seen an episode of the show, but as a toy, I think Jase works perfectly within it’s limitations.